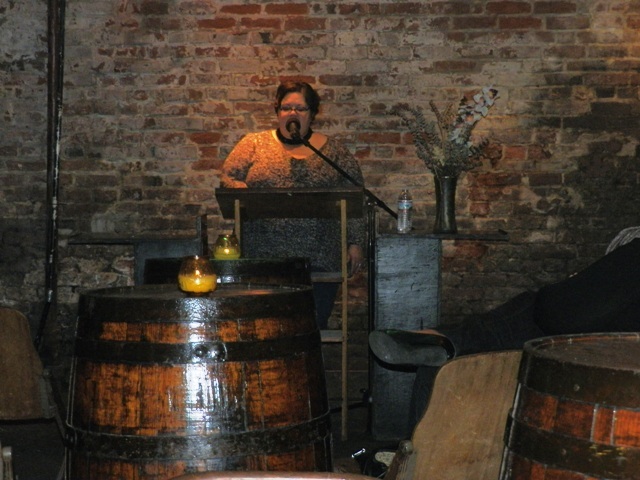 I was honored to be one of the features at The Goldmine in the French Quarter for the 17 Poets! Series on Thursday, November 15th. Great thanks to Dave Brinks and Megan Burns for the honor and for being such wonderful hosts. I am a big girl but I do not like to travel alone. My Vice-BFF Lian accepted my invite to travel with me, and for this I am grateful. Lian acted as my navigator and deejay on the way to New Orleans. We took HWY 90 East to New Orleans which I prefer over traveling I-10. I-1o makes me nervous. Pile-ups and 100 mph’ers make me nervous. HWY 90 (the Future 1-49 Corridor) is scenic and chill. On our way to NOLA we listened to a mix CD Lian made for me for my birthday a few years ago (we have been friends for 8 years) Jill Scott, and Joni Mitchell’s “Court and Spark.” It was good groovin’ on HWY 90, let me tell you. We arrived at our hotel at approximately 7 pm which was perfect timing. We chilled and freshened up then caught at cab at about 7:30 pm. The reading was set for 8 pm but really we had plenty of time because we were in the cosmic groove. New Orleans is in The Cosmic Groove. Our cabbie was from Haiti and didn’t feel like talking. He got us there and we paid him well. When we walked in the door of The Goldmine we got a big hug from Dave. It was great to see him again. Dave is an accomplished poet and a very generous soul. He and Megan read for the Voices Seasonal Reading Series in the summer. Dave told me that drinks were complimentary for the “features” and I wondered if I would out-drink my welcome. He laughed at that. I ordered a Wild Turkey 101 and water. It was very good and knocked the chill and nervousness right out of me. We met poet Deborah Poe and her colleagues from New York. After we settled in a booth, we got to talking with these lovelies about our Cajun culture, which Lian and I are both very passionate about. I hope we gave a good impression because we want to be good ambassadors for Acadiana. We talked about boudin and cracklins and crawfish and we gave the New Yorkers an open invitation to Acadiana for any future travels these women may make to Louisiana. I went on first. I was happy to read from “Eating the Heart First” in a place that has a 50 year tradition of hosting poetry events. I felt empowered and inspired. I selected several poems that lend themselves well to public readings. I interspersed a few personal narratives between the poems. I kept the reading tight and gave thanks for the audience’s kind attention and applause. I read “The Never That Was” and one line is the lyric “blackbird fly, blackbird fly” which I actually sing when performing the poem. I love reading/performing this poem. It is an opportunity for me to channel my inner Rock Star. Who knows? Maybe one day I will front a band. I was well-received by the generous, supportive audience. I bounced back to our booth and listened intently to Deborah’s and Matvei Yankelevich’s readings. Both are superb poets and gave entertaining and powerful readings. Lian and I stayed for the Open Mic and whooped and hollered in appreciation for the people who stepped up. That’s just how we are. We live big wherever we are. It was an impressive night all-around, ending with a great breakfast at midnight, then sleep in comfy Queen-sized beds. We are already planning a return to NOLA with more friends and will certainly pop in at The Goldmine to say hello.